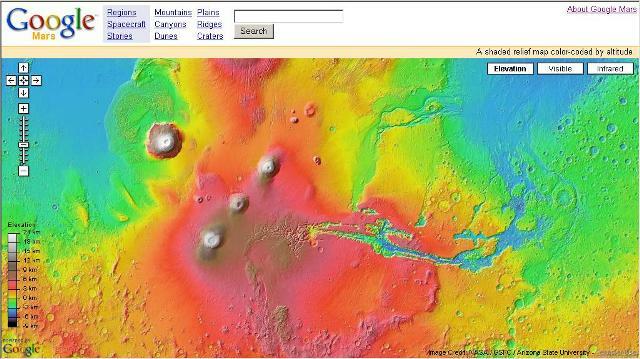 Astronomy lovers can now view the 3D detailed map of Mars on Google Mars. It’s a service that much like Google Maps, except that the maps shown is not surface on Earth, but surface of Mars instead. Elevation – A shaded relief map, generated with data from the Mars Orbiter Laser Altimeter (MOLA) on NASA’s Mars Global Surveyor spacecraft. This map is color-coded by altitude, so you can use the color key at the lower left to estimate elevations. Visible – A mosaic of images taken by the Mars Orbiter Camera (MOC) on NASA’s Mars Global Surveyor spacecraft. MOC is like the digital camera you have at home. Basically, this is what your eyes would see if you were in orbit around Mars. Infrared – A mosaic of infrared images taken by the Thermal Emission Imaging System (THEMIS) on NASA’s Mars Odyssey spacecraft. Warmer areas appear brighter, and colder areas are darker. Clouds and dust in the atmosphere are transparent in the infrared, making this the sharpest global map of Mars that’s ever been made. You can browse the Mars surface landscape the same way as you use Google Maps or Google Earth. And Google is working towards Mars landscape can be navigated via Google Earth client itself. Google logo on Google homepage which will show “Percival Lowell” when mouse over it. Click on it will lead you to Google Mars.